Just a note upfront: in order to really discuss this film’s biggest strengths and weaknesses I will need to touch on some specific story beats that happen in the second half of the film. I hate to do two spoiler reviews in as many weeks, but I feel somewhat less guilty considering this is based on a nearly 90 year old novel that you were probably made to read in high school. Like just about everyone else in the country, I read F. Scott Fitzgerald’s The Great Gatsby in high school, and at the time I wasn’t particularly a fan. Obviously my tastes have changed since high school, and it’s entirely possible I would feel differently now, but what I remember most prominently about the book is that Fitzgerald seemed far more preoccupied with describing every inch of the locations his characters occupied than he was with letting the characters live in that world. Again, these are the vague recollections of the pretentious opinions of a high school student, and potentially not at all reflective of what my opinions might be if I were to revisit the book. That being said, I bring this up because Baz Lurhmann’s adaptation similarly relishes in the atmosphere and aesthetics of the film, sometimes at the expense of a strong emotional bond to the characters, yet in spite of this I found the film highly engaging and thematically resonant. Luhrmann has always been an extremely polarizing filmmaker; his films are stylistically flashy and extravagant (some might say ostentatious) and, as films like Romeo + Juliet and Moulin Rouge! show, he revels in anachronisms. Personally, I’ve always enjoyed his work (with the exception of the well-intentioned, but overstuffed Australia), but I understand why some are turned off by it. In a way Lurhmann’s voice as a director is similar to that of Michael Bay’s. Don’t get me wrong, they’re very different filmmakers, at his core Luhrmann is an optimist while Bay is cynical to the point of near sociopathy, yet both directors lack subtlety and both revel in extreme excess. However, while Bay more often than not takes on projects that conflict with his sensibilities, Luhrmann seems to be fully aware of the type of films that would work with his style. With that in mind, F. Scott Fitzgerald’s rather detached story of early 20th century decadence may not seem like a natural fit for Luhrmann’s over-the-top extravagance, but he finds a way to match it with his style without betraying the classic novel. 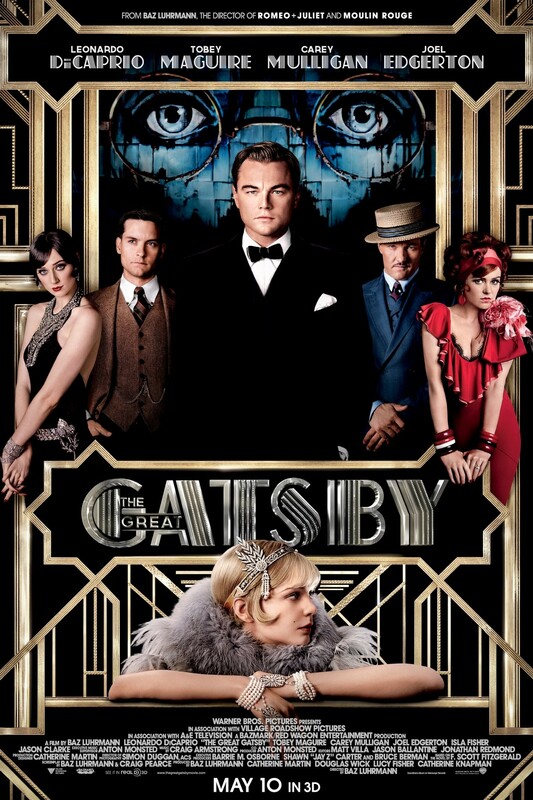 In The Great Gatsby Luhrmann captures the extreme frivolity of the roaring ‘20s with a palpable energy. Wild parties with glitter and fireworks and blaring hip-hop music; it’s 1922 as viewed through the lens of 2006. While the film is still distinctly Luhrmann, the hyperactive visuals are reigned in a bit this time. There’s still plenty of his campy flair like Gatsby being introduced with a swell of Gershwin’s Rhapsody in Blue and a flash of fireworks, and as I mentioned the anachronistic music is still present and accounted for, but it’s all slightly more subdued this time. Part of this comes from the fact that the film was shot in 3D, which prevents a lot of the quick cuts and fast camera movements that he’s utilized in the past, however, with 3D Luhrmann has added a new tool to his stable and uses it quite effectively. Whether it’s slowly gliding over the river in between East and West Egg towards the green light or diving off a New York skyscraper to get a closer look at the action down on street level the 3D is put to good use and really enhances the visuals of the film. Luhrmann also smartly allows the 3D to be more restrained when it’s not needed. It’s among the better uses of the technology and definitely the way to see this film. Like the novel, the story of the film is told from the perspective of Nick Carraway, but unlike the novel it’s not nearly as harsh and cynical towards its characters. Now some may take issue with this change, but to me it makes absolute sense. As Carraway’s friendship with Gatsby establishes itself Carraway finds himself swept up in Gatsby’s earnest, if misplaced, optimism. Yes, ultimately Gatsby is a fool and wastes his life pursuing something that was never worth the time, but where Fitzgerald paints him as a fool, a crook, and a liar who got what was coming to him, the film portrays him as a tragic figure who was swept up in the dream of something that never really existed. The reason I feel this change is appropriate is because that’s precisely the way Carraway saw him, and as he is the one telling the story we really should be seeing it through his eyes. The movie deals with the idea of being both within and without a situation and in a way that’s what the film accomplishes. Gatsby’s foolishness, Daisy’s shallowness, and Carraway’s starstruck awe are all on display to be seen, but the film itself advocates for Gatsby, just as Carraway would. To me, I feel this is a more interesting way to handle the film from a character perspective. We recognize what’s wrong, but at the same time we can feel for the character’s situation. Pursuing an ideal of something that doesn’t necessarily match its reality is a very human concept, and it’s something that at it’s core is relatable. Rather than simply dismiss these characters as shallow rich people dealing with insignificant problems, it tries to find humanity in them. The problem, however, comes again from the film’s theme of being within and without. The film lets us sympathize with these characters, but makes it difficult to empathize with them. This is no fault of the actors as every single one of them turns in a solid performance, but more an issue of the theme. The film wants to invite us inside, but for anyone paying attention, there’s enough there to make you realize that inside’s really not as great as the characters think it is. Again, it’s that dichotomy of within and without, but the effect is a film that wants us to be at arm’s length and feel for these characters at the same time and it results in a dissonance that never quite works in the film’s favor. That being said, there is a lot to enjoy about The Great Gatsby. It’s an ambitious and impressive take on the classic story and takes on some interesting narrative ideas even if the theme sometimes conflicts with the emotion. It takes a story that was cold and cynical and tries to infuse it with the same sense of misplaced optimism that Jay Gatsby himself has. It may not work perfectly, but there’s definitely something to be said for trying to get at the heart of who these characters are on a human level. It made me enjoy a story that I remember disliking and because of that makes me compelled to give the novel another shot. That, in and of itself, is perhaps the highest praise I can give this film.